A few weeks ago my friend came over for a raw night and made a delicious pesto pasta. 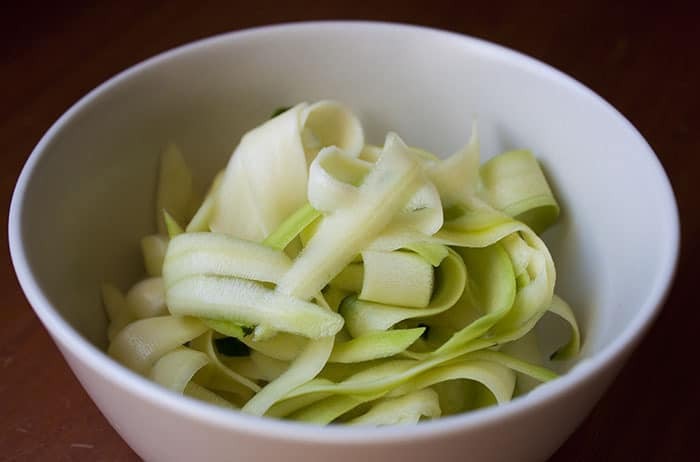 It was the first time I had eaten zucchini noodles and was shocked at how perfectly they worked as a pasta noodle substitute. After that night I was craving the meal but didn’t have all the ingredients, so I came up with my own quick and easy version. Why zucchini noodles? 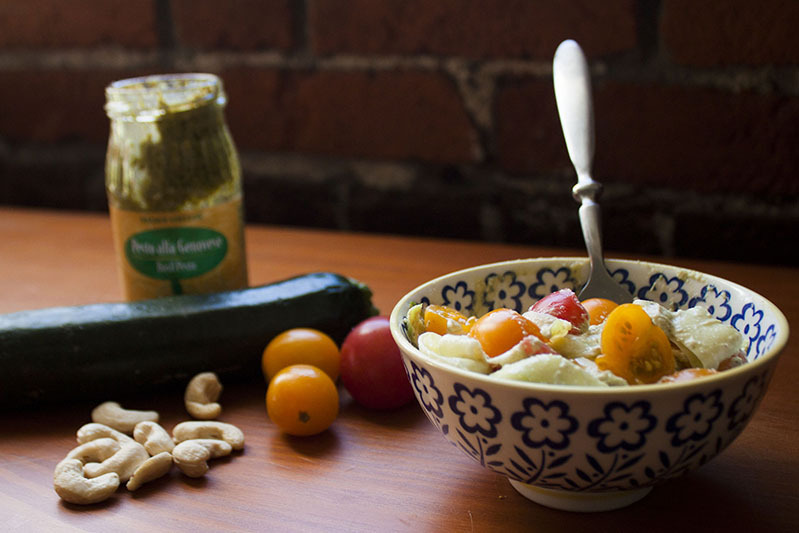 Zucchinis are a great low-carb option that are also high in Vitamin C and potassium. They taste pretty great too. Why the cashews? 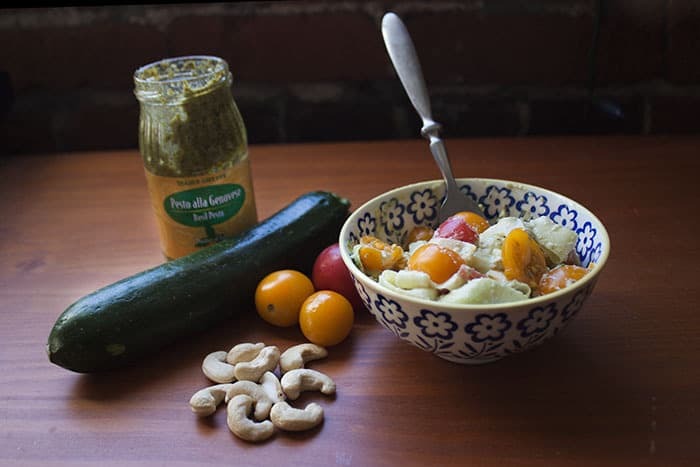 Blending cashews gives your pesto a rich and creamy texture. Have fun with this recipe and change it up however you’d like. I’ve made it before with mushrooms, but I think prosciutto and sun dried tomatoes could be great in it too. You might also want to try Healthier Zucchini Bread, Sweet Zucchini Pickles, Zucchini Ricotta Galette, and Dark Chili Chocolate Oatmeal Cookies (With Zucchini). 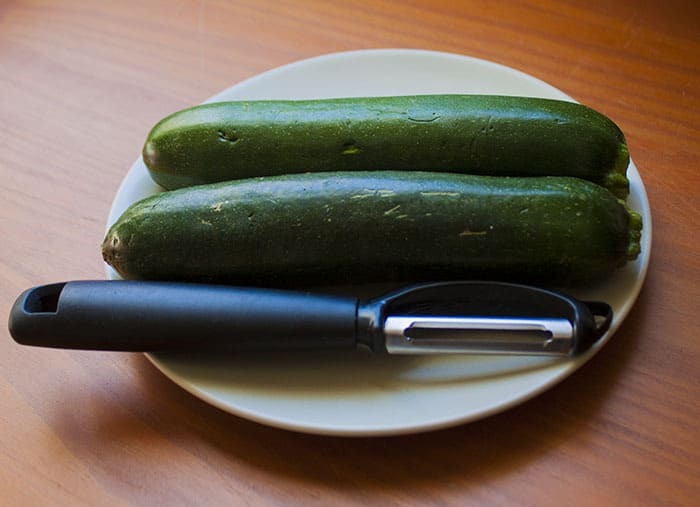 Start by peeling down your two zucchinis with a mandolin, julienne peeler, or potato peeler. Stop once you have gotten to the seeds. Look at those tasty noodles. 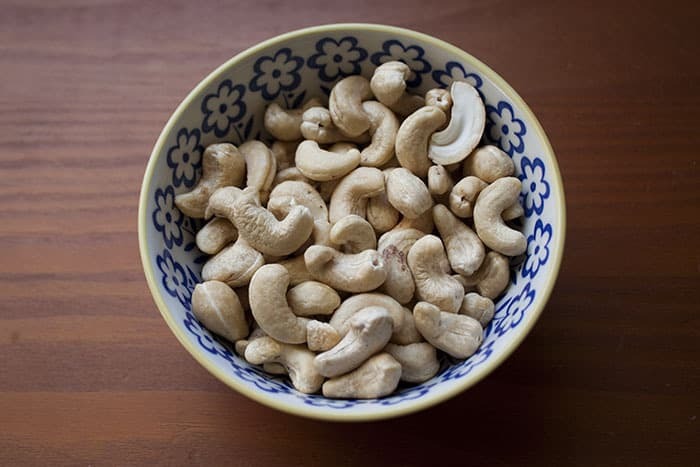 Place your cashews in the blender. Add in pesto, water, and coconut oil. Blend on high until it turns into a delicious pesto cream sauce. 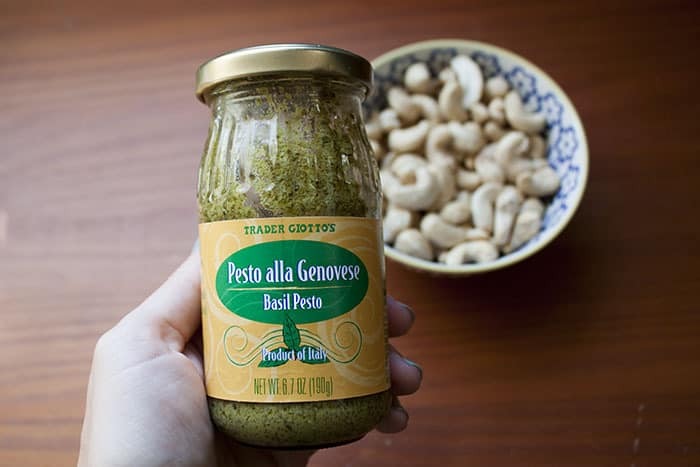 Give it a taste and see if you want to add in more pesto or even a diced clove of garlic. Top your noodles with the pesto cream sauce and any other fixings you’d like – tomatoes, mushroom, onions, etc. Hi there. I found this one on google while searching for information. The post posted was very informative and valuable. You individuals are performing a terrific job. keep going. And thanks for giving your ideas about this. Good way of telling, and pleasant paragraph to take data concerning my presentation topic, which i am going to convey in university.